Don’t you agree that spending time in nature is a wonderful way to relax, slow down and reflect on your life? I’m even more intrigued by the fascinating landscapes and nature experiences across Africa. No matter if you climb the fiery red sand dunes of Sossusvlei in Namibia, explore the African Bush on a walking safari in Zambia or fly over the wide golden plains of the Masai Mara in a hot air balloon. Your problems seem insignificant and you simply enjoy the moment; you live in the here and now. I have always wondered how amazing it would be if we could use the power of nature to deal with the challenges of daily life…? I did some research on this topic and I came across D’un pas décidez, an outdoor coaching company in France. I recently met the owners – Christophe Hofstetter and Henri-Pierre Michaud – in Strasbourg. For nearly a decade, Christophe and Henri-Pierre share their unique approach to business coaching mainly with small and medium sized businesses. I’d say they are pioneers in outdoor coaching and have perfected their methods over the years. Together they look back on many successful coaching events with companies such as Adidas, McCain or Wrigleys. Christophe, what makes D’un pas décidez so unique? We are taking our clients on easy hiking or walking tours while applying methods of business coaching in a natural environment. This doesn’t mean that our participants need to be super fit, nor do they undergo a military training or learn survival skills or technique. Our clients are immersing in nature and reflect on their daily business challenges. While walking, your brain is stimulated to come up with new thoughts and creative ideas. Various elements of nature may be used as symbols creating new associations and images within your business life. What is the key difference to ‘traditional’ coaching methods Henri-Pierre? Instead of being constrained by four walls, we are using the outdoor as an intense learning environment. When you are not happy with something in your life, you can feel it in your entire body. You feel heavy or uncomfortable. As soon as you start doing light exercises, for example hiking, you can feel the positive effect on your body. Your immune system gets a boost, you feel more energized and you become calm and relaxed to focus on the things that are going on in your life. Outdoor coaching creates a positive balance between body and mind that cannot be achieved when sitting in a conference room. You both mentioned that nature is an ideal learning environment. Why is that Christophe? It is scientifically proven, that our brain remembers a story easier when we combine strong positive emotions with it. The more sensual impressions we have, the more positive emotions we can recall from our memory. Outdoor coaching creates these emotions by combining active movement with mental work. From own experience, I think everyone can relate to the fact that nature offers a lot of intensive sensory impressions: breathing fresh air, listening to the sounds of nature, and smelling the forest ground. Hence it is an ideal learning environment. Can you tell me a little bit more about the ‘elements of nature’ Henri-Pierre, that you are using during your outdoor coaching sessions? Elements of nature could be trees, intersections or other paths crossing our way. It could be small objects such as stones or larger objects such as a fallen tree. Many objects from nature can symbolize a situation in your life. That way, elements of nature help to make things more accessible and more comprehensible supporting the thinking process in a very playful way. The elements we use are really depending on what we find and see during the walking, and what we think is the best for our customer at that very moment. What are your client’s main challenges Christophe? As far as team coaching is concerned, the majority of our clients decide to do outdoor coaching to develop a strong team spirit. Through our work we help the team to identify challenges, problems or conflicts, and together we develop concrete solutions for a lasting and successful cooperation amongst the team. Of course, each participant has the opportunity to reflect on their life overall and take away helpful impulses to improve their private life, for example work-life balance. One major theme everyone is struggling with is a fast-paced working environment. Our coaching sessions help teams to slow down, take time to reflect and ultimately get faster to success. If a company would like to use your service, what is the process? We are not about “Once size fits all”. Hence, it is very important for us to meet and discuss the needs of the overall business or individual teams. Would you like to create a common vision? 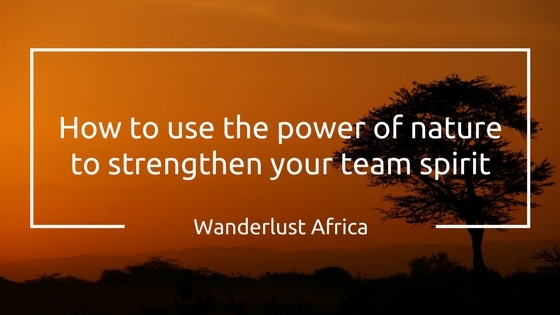 Is it about strengthening the overall team spirit or improve communications amongst the team? Depending on our client’s objectives, we develop a customized outdoor coaching program. Although one successful outdoor coaching day can already bring successes and improvements, past experience shows that continued sessions intensify the results. Again, this can all be tailored to our client’s needs. Christophe and Henri-Pierre, many thanks for sharing insights on the workings of D’un pas décidez. I’m certainly inspired by your work and unique and innovative approach. If you are looking for a new approach in bringing your teams together, I’d like to hear from you. Perhaps you even would like to go a step further and combine outdoor coaching with elements of nature in Africa…?